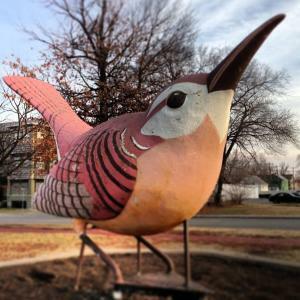 That massive beaked sculpture is actually the world’s largest wren. It spent nearly five decades perched atop the WREN Radio building on 10th Street. The WREN wren was crafted of wire mesh and concrete in the 1930s, by a now unknown artist. In 1993, when the radio station closed, the wren was purchased by Historic Topeka Inc. for $1,500 and restored and painted by Buck Thomas. The wren then made its current nest in Huntoon Park. WREN Radio is now online-only, playing oldies from its headquarters in North Topeka.